Last week, I conducted some user studies to learn about music libraries. One of the participants commented on how cool mix tapes were yet how rarely he creates playlists in iTunes. I started to wonder about the differences between old and new music media formats. In particular, I was interested in the differences between mix tapes (cassette tapes created by the user from other cassettes or CDs) and digital music playlists (lists of current or saved songs in digital music players like iTunes or Windows media player). I found various theoretical concepts helpful in thinking more precisely about these differences and how we might improve the design of digital music technologies. Philosopher of technology Peter-Paul Verbeek advocates a (post)phenomenological conceptualization of technology emphasizing the concept of technological mediation. According to this theory, things are not neutral “intermediaries” between humans and the world, nor are things determining. Rather, artifacts are mediators which actively mediate the relation between humans and the world. Digital playlists and cassette tapes each mediate, in different ways, how we act on and interpret the world. For instance, cassettes tapes are usually listened to in their entirety, rather than selecting individual songs. While this is not impossible, it is difficult given the one has to manually find the song which can take a lot of time and effort. In contrast, with digital music players, we can easily either manually pick songs, or we can automatically change the order of listening, e.g. recommendations on Pandora or Last.fm, shuffle mode in iTunes. Mix tapes tend to be more enduring than digital playlists for several reasons. First, they are more difficult to edit and create. You are more likely to grow to like a song rather than change it, as you would a digital playlist. Second, the practical limitation on the time it takes to create mix tapes encourages careful planning and reflection. With a mix tape, you listen to each song and have time to plan the next as you are recording. Because mistakes are costly to correct, mix tapes tend to be designed more carefully than digital playlists or burned CDs. With digital music you can simply drag and drop some songs into the playlist. If you decide you don’t like it, you easily change it. Hence, cassette tapes tend to be more “culturally durable” than digital playlists or even CDs, due to the ways that digital music technologies mediate action and interpretation. Mihalyi Csikszentmihalyi and Eugene Rocheberg-Halton, in their book The Meaning of Things: Domestic Symbols and the Self, present an empirically grounded study of how people develop deep relationships with things and imbue them with meaning. They propose a theory which explains this in terms of an active process between people and objects, which consists of three elements: aesthetic qualities of an object, attention (or “psychic energy”) directed towards an object, and the goals and outcomes of the transaction, such as a representation of personal values. Achieving this type of deeply meaningful relationship with objects appears quite difficult with digital music and “digital things” in general for several reasons. First, digital playlists lack a stable and closely related physical form or substrate, such as a cassette tape. As such, digital things may be lacking aesthetically in certain aspects. While one could argue that the laptop or iPod is a stable and closely related physical form, neither of these get close to the song level of granularity, in the way that a cassette tape is related to a fixed 60 minutes of music. You can’t write on and personalize a digital music playlist the way you can with a mix cassette tape. The digital song, album or playlist that is perceived to exist within iTunes lacks both the uniqueness and certain sensorial qualities of a physical cassette tape. Semiotics, which is concerned with how meaning is constructed through signs, offers yet another way to help understand the difference between cassette tapes and digital playlists. While the sign value of the actual music is very similar between the two formats, the formats themselves and the technologies used with them also have sign values. The most interesting are the connotative sign functions of tapes and playlists, which in contrast to denotative sign functions, work by association rather than literal meaning. In fact, signs can act as mediators, and the way that an artifact mediates can affect the sign value of the artifact. The name of a song or the words of a song typically have literal meanings (denotation). However, these same signs can also connote emotion, physical properties, and lifestyles. The music someone listens to says a lot about their identity or how the want themselves to be perceived by others. With digital music, people tend to have much larger and diverse library, due the ease with which music can be created and shared. 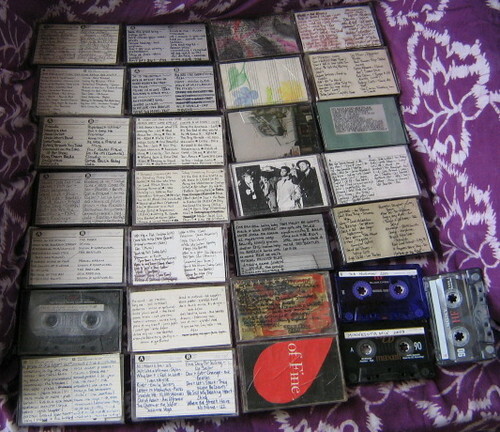 With cassette tapes, a person was more likely to stick close to a core musical identity because of the practical constraints of acquiring and mixing new music tapes. The opportunities for displaying the sign values of music, intentionally or otherwise, differ with cassette tapes and digital playlists. Because cassette tapes have a physical presence, they offer opportunities to communicate their sign value in ways that is difficult for digital playlists. For example, the cassettes displayed in someone’s home represent that person’s musical tastes, and the cassette tapes left in or around their tape player represent the current tastes of the individual. The ways these signs present themselves is often a natural byproduct of use. With digital music, it is easier to share you music lists with people remotely, except this process typically requires active participation from the sender or receiver. In order to naturally help communicate my identity through music in my home, I could leave my iTunes running on my computer, or even print out a list of songs I recently listened to, but these are typically not as natural as a physical library of cassette tapes. Signaling theory, which asks about the reliability of sign values, offers even more insight into these issues. While it is possible for someone to record or purchase lots of tapes in order to convey a certain lifestyle, this would be very costly. In contrast, this can be done more cheaply with digital music. Hence, having a large music library does not imply the same thing as a large library of cassette tapes. While it is easier to actively share digital music, it is also easier to actively hide it. All of my guilty musical pleasures can be easily and naturally be tucked away somewhere in my music library. However, some music programs like iTunes and Last.fm, which show songs recently or frequently listened to, can actually enforce that user is kept honest. In light of these insights, we might consider several strategies for designing digital things, in particular digital music technologies, so they can be more “culturally durable”, or possibly even lend themselves to the types of deeply meaningful relationships between the self and objects described by Csikszentmihalyi and Rocheberg-Halton. One strategy is to make digital material more stable. One way to approach this is by creating digital histories as a way to create more cohesive digital objects. For example, a favorite digital playlist in iTunes could represent itself as list composed of only the songs that have recently been listened to, yet the playlist’s history can contain many thousands of songs. In this way, the digital data itself can change rapidly, yet the representation may encourage the user to interpret and construct the playlist as a single evolving entity. Thus, a history of choices made over time comes to represent a more stable digital object. The interface could suggest or encourage different focal points for these playlist histories, such as by musical theme (e.g. a particular artist or genre) or use context (e.g. parties, a particular party). Certain playlists, such as the songs played during a particular party, could also be immutable, which could perhaps help them acquire that certain enduring, “mix tape” quality. In this case, the playlist does not become static due to practical constraints, but rather due to the software recording a particular set of choices in time which correspond to a personally meaningful event (or an experience). To further this idea, pictures or other sensorial data surrounding the event could be associated with the playlist. While digital playlists may lack certain material aesthetics of touch and smell associated with tapes and vinyl, digital offers unique opportunities to represent potentially richer aesthetics through visual and auditory senses. Another approach to making digital material more stable would be to more tightly couple digital and physical material. For example, listening to songs in your music library could cause your iPod to physically change, similar to the way a record album wears due to frequent usage. These physical signs may also be more reliable, in that it may be more difficult to fake than, say, a digital representation of physical wear and tear. However, this approach is still potentially problematic in that there is not functional basis for the wear, and hence, people may be less likely to initially adopt or continue to use such a product without it offering more short-term functional benefits. This may also be problematic because much of the sign value related to digital music can so easily be transferred. Hence, unless the object itself is easily upgradeable, short-term functional goals such as the need for more storage space on you iPod may take precedence, leading to the purchase of a new iPod. One concept that addresses some of these issues is a portable digital music player that displays the most recently listened to music, but allows the user to delete or add songs to this display. Although by default this lists acts as a “recently played” list, it would not be labeled so. In this way, the user can choose songs to represent themselves (even if they never actually listen to them), but the easiest thing to do is simply let these be a ‘true’ representation. Functionally, this serves to make it easier to listen to music you like, but also has symbolic value. This list could also be compared with people in the near vicinity, perhaps through an augmented reality display of the people and their music players. In this way, the system is similar to choosing to leave the records you’ve been listening to out in view. The design doesn’t force the user into showing only certain music (such as the music they actually listen to often), nor does it explicitly enable the user to claim something untrue (such as changing a list labeled “recently played”). The question tending to motivate my analysis above was “how can we take the qualities we like about cassette tapes and other traditional music media formats, and design them into newer digital music formats?” However, there is still of course the question of the desirability of these qualities. In terms of environmental sustainability, it is relevant to consider designing for cultural durability and meaningful objects*. Csikszentmihalyi and Rocheberg-Halton’s work also offers some empirical evidence that designing for these qualities is desirable in terms of personal meaning, enjoyment and pleasure. Verbeek’s philosophical writings also offer a compelling argument for the aesthetic qualities of engagement with stable, physical things. Personally, I feel that designing for cultural durability and meaningful objects has great potential to improve the human condition, possibly on many levels at once (e.g. short-term pleasurable interactions, long-term enjoyment and meaning, longer-term social and environmental sustainability). However, it is probably also the case that digital music is yet another form of creative destruction, simultaneously both destroying qualities that are valued and creating the possibility for other qualities that are valued. It is interesting to note that the fluid, flexible nature of digital media does not preclude the possibility of using it in static, fixed ways. Digital music technologies do, however, mediate action and interpretation in ways that tend to discourage static, fixed usage. I could easily simulate many of the constraints of a mix tape in iTunes, although I don’t. It seems likely that these trends may continue, and even the notions of song, artist, and album become less stable. * It is often taken as obvious truth that creating durable products means more sustainable products. While this feels right, I have yet to see any theoretical calculations to support this, or any empirical evidence that this is true, in practice. OK so am I the only one who has seen these? It’s a flash drive packaged as a tape to bring on that mix tape aesthetic. http://www.geekologie.com/2007/10/mix_tape_flash_drive_is_retrom.php is but one example, but the photo is better than some.